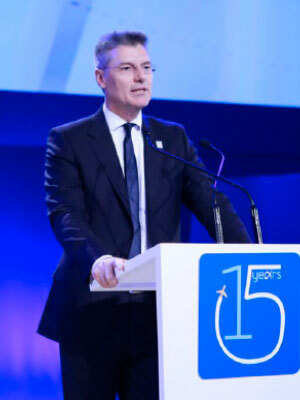 ACI EUROPE this year marks 25 years of serving and leading the airport industry. It is an opportune time to recognise the many airports among its membership that celebrate their own anniversaries in 2016. Report by Ross Falconer. Bart Siemerink, Director of the Keukenhof flower garden, and Jos Nijhuis, President & CEO of Schiphol Group, christened the Schiphol tulip on the airport’s Panorama Terrace in April. 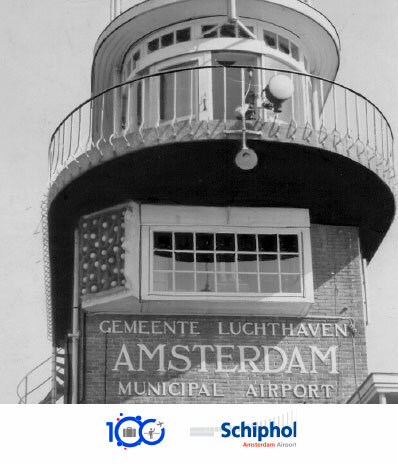 The Amsterdam Airport Schiphol control tower c.1930. Amsterdam Airport Schiphol is celebrating its 100th anniversary this year and has marked the occasion in a unique way. A special tulip – christened the Schiphol tulip – has been developed. It is an orange Triumph tulip, which reaches a height of 40cm and flowers in April. The first 10,000 bulbs became available earlier this year and will be given away as promotional gifts at various events. The airport opened in 1916, with the first flight landing on 19 September of that year, and remains in its original location. It has grown from an airfield used by the Aviation Division of the Dutch Army, into a major hub airport and an economic engine for the regional and national economy. AMS handled 58.2 million passengers in 2015, with 322 direct scheduled destinations. Joanna Lumley recently unveiled the final plaque in a series of 70 installations to celebrate Heathrow’s 70th anniversary. To celebrate its 70th anniversary, London Heathrow has unveiled 70 unique platinum plaques, which are on show around the airport. Each plaque represents an iconic moment of British culture from the past 70 years. Heathrow has played host to some of Britain’s most memorable moments, from The Beatles return to the UK as global superstars in 1964, to the England rugby team’s arrival home as World Champions in 2003. Meanwhile, in 1952, Her Majesty The Queen stepped onto sovereign soil at Heathrow for the very first time as the reigning monarch. 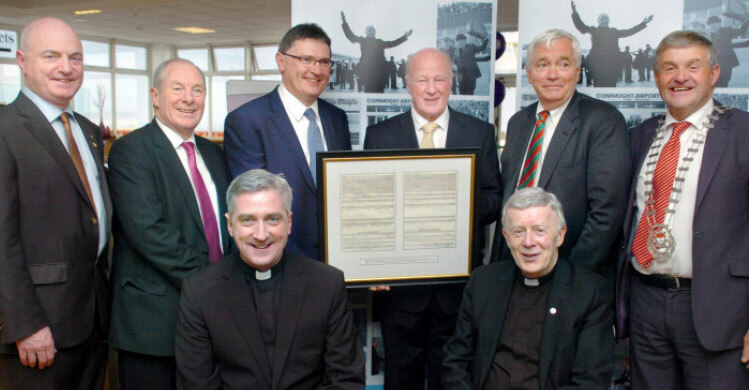 The Ireland West Airport Board are presented with the original flight plan documents for the first-ever commercial flight – Aer Lingus into Knock Airport – by Paddy Judge, former pilot with Aer Lingus. Judge was pilot of the first-ever Aer Lingus flight out of Knock Airport in October 1985. Ireland West Airport celebrated the 30th anniversary of its official opening with a gala concert in the terminal on 27 May. 150 invited guests attended a gala dinner followed by the concert hosted by Mid West Radio, looking back at the last 30 years of the airport. 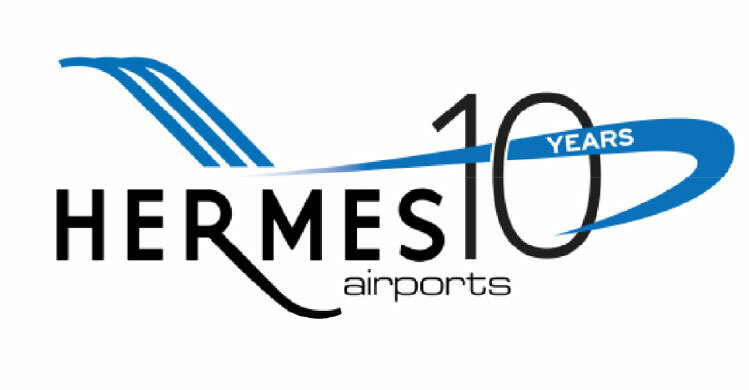 Hermes Airports, operator of Larnaka and Pafos airports, marks 10 years of successful operation in 2016 – a decade in which it has undoubtedly made a significant contribution to the economy, society and tourism of Cyprus. It has adopted a new anniversary logo to commemorate the occasion. Throughout the year, the company will hold a series of events, the highlight of which will be a special event held at Glafcos Clerides Larnaka International Airport, featuring the Cyprus Youth Symphony Orchestra. Over 70 airlines currently use Larnaka and Pafos airports, connecting Cyprus with more than 110 destinations in 40 countries. Meanwhile, the airports handle over 7.5 million passengers annually. Hermes Airports supports 12,700 jobs, and contributes over €500 million to the economy – equivalent to approximately 3% of Cyprus’ GDP. 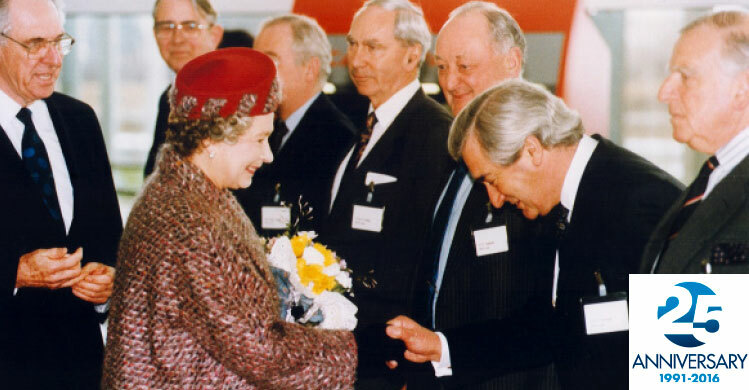 Her Majesty The Queen officially opened London Stansted Airport’s iconic terminal building on 15 March 1991. London Stansted Airport has celebrated the 25th anniversary of Her Majesty The Queen officially opening the iconic terminal building on 15 March 1991. Stansted originally began life as a World War II USAAF base, but was transformed by the development of a new £400 million (€500m) terminal designed by Lord Foster. Since the first flight departed to Glasgow on 19 March 1991, over 350 million passengers have passed through the terminal on over 3.2 million flights. The terminal has been extended twice in the last 25 years – a £50 million (€65m) extension to the arrivals area opened in 2008, and following Manchester Airports Group’s acquisition in 2013, the terminal has undergone an £80 million (€100m) transformation along with an £11 million (€14m) upgrade to the Satellite One departures area. Today, the airport serves over 170 destinations and 23 million passengers a year compared with less than 50 routes and 1.1 million passengers when it opened in 1991. As part of its Golden Anniversary celebrations, Glasgow Airport has tracked down the first aircraft to land 50 years ago – a Cherokee 6. The all-important test flight ensured the airport was able to pass the rigorous tests set by the then Ministry of Aviation, enabling it to officially open for business the following day. 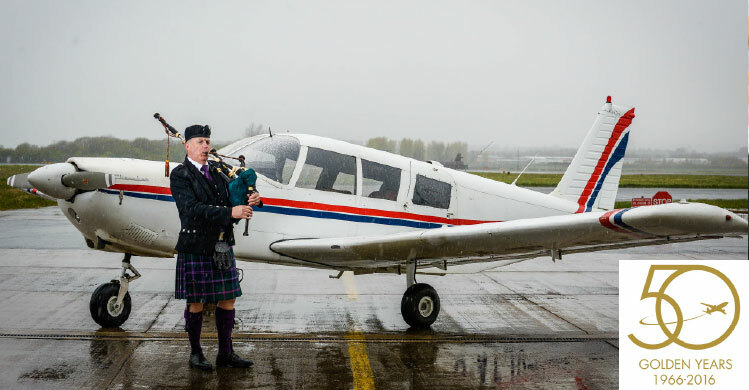 Since that first landing, Glasgow Airport has gone on to play a pivotal role in connecting Scotland with the world. Athens International Airport completed its first 15 years of operations on 28 March. It has placed corporate social responsibility at the heart of its actions to commemorate the anniversary, including supporting the Prolepsis Institute, to alleviate nutrition problems for children attending local public schools, and a year-long collaboration with child welfare organisation The Smile of a Child. Meanwhile, it is cooperating with Marketing Greece on an interactive campaign – ‘Speak Athenian. Be an Athenian’ – to promote Athens. A de Havilland D.H.86 at the official opening of Gatwick Airport in 1936. 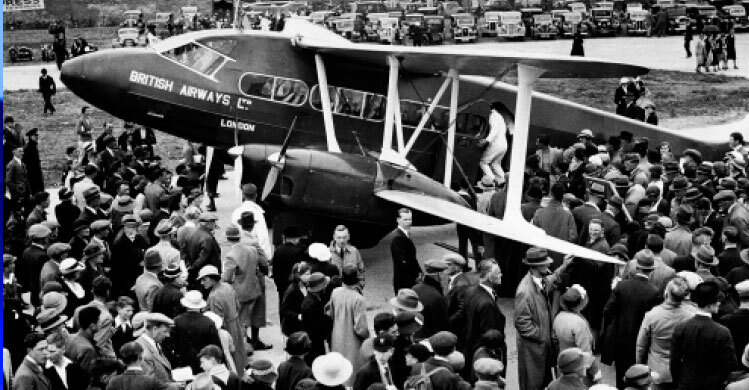 On 17 May London Gatwick Airport marked the 80th anniversary of its first commercial flight, to Paris. Since then, the airport has grown to become the world’s most efficient single runway airport, and recently announced it had served 41 million passengers in a 12-month period for the first time. Paris was one of just five scheduled routes served from the airport in its first year of operation, the others being Malmö, Amsterdam, Hamburg and Copenhagen. Gatwick is now connected to over 200 destinations in 90 countries. Over the last 80 years, it has played host to many prominent figures including Her Majesty The Queen, Princess Diana, and President John F Kennedy. Key aviation milestones include the first-ever Virgin Atlantic flight taking off from the airport on 22 June 1984. 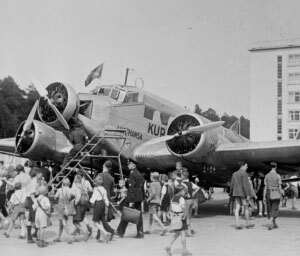 8 July 1936 marked Lufthansa’s first scheduled flight at Rhein-Main Airport, with a JU 52. Frankfurt Airport this year marks the 80th anniversary at its current location. Fraport AG, the owner and manager of FRA, Germany’s biggest airport, looks back on a long tradition as a provider of airport services. Founded in 1924 under the name Südwestdeutsche Luftverkehrs AG, the company initially operated Frankfurt Airport at the Rebstock site. With the 1936 opening of Rhein-Main Airport adjacent to the Frankfurt Kreuz autobahn intersection, the core of what is today’s Frankfurt Airport started operations. Today, FRA serves as the main European hub in the dense global network of the Star Alliance airlines. It exceeded 60 million annual passengers for the first time in 2015, handling 61 million (+2.5% year-on-year). Photo credit: Colin Mcleod, from Easter Longridge, West Lothian, shot from the Air Traffic Control Tower. 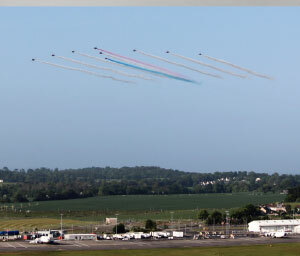 Edinburgh Airport’s centenary celebrations saw a spectacular Red Arrows fly-past at 18:22 on 4 June, with the occasion captured by two lucky plane-spotting competition winners. 10 Hawk aircraft from the Royal Air Force Aerobatic Team completed the pass over the airport. The jets flew in a wide formation known as the Wall, at a height of 500ft and at about 400mph. On Thursday 2 March 1916, Edinburgh Airport began life as a Royal Flying Corps aerodrome named Turnhouse and was a key military base for the remainder of World War One. The British Airports Authority (BAA) took over ownership of the airport on 1 April 1971. Initial stages of the redevelopment began two years later and the terminal building, designed by Sir Robert Matthew, was opened officially by Her Majesty The Queen on 27 May 1977. Lanzarote Airport celebrated the 70th anniversary of its first commercial flight, and the 10th anniversary of its Aeronautical Museum, with a unique event that recreated the airport in the 1940s. Lanzarote Airport has celebrated the 70th anniversary of its first commercial flight, and the 10th anniversary of its Aeronautical Museum. It held a unique event, recreating the airport as it was in 1946, with guests wearing 1940s dress and airport facilities and vehicles from the era faithfully recreated. During the ceremony, a tribute was paid to all those who have worked at Lanzarote Airport since 1946, with a new space dedicated to them opened in the Aeronautical Museum. 533 travellers used the airport in 1946, and passenger numbers have grown to over 6.1 million in 2015. Meanwhile, the Aeronautical Museum has been visited by 40,000 people since it opened in 2006. Warsaw Chopin Airport recently marked 82 years of operations and released pictures of the President of the Republic of Poland Ignacy Mościcki during the opening ceremony on 29 April 1934, as well as some pictures from the very early stages of the airport’s history. In its first year of operations, Warsaw Chopin served about 10,000 passengers, while in 2015 it handled a record 11.2 million.